Hand Cast Hand Painted Stoneware Vase. With impressed factory marks and date 15.3.00 on the base. Pre-owned. In very good condition. 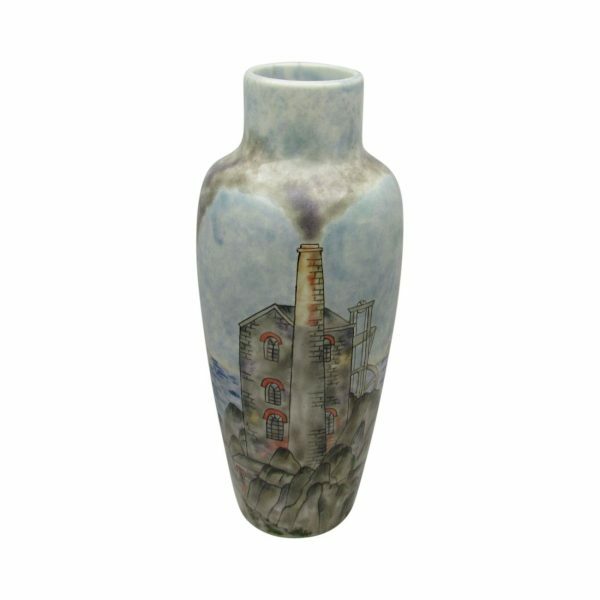 Cornish Tin Mine Design Vase. Produced by Cobridge Stoneware. And designed by Philip Gibson. A trial piece with the impressed factory marks and date 15.3.00 on the base. Hand Cast. Then hand painted at the Cobridge Stoneware factory. Based in Stoke on Trent. Closed down in 2006. Cobridge Stoneware was part of the Moorcroft group of companies. Pre-owned. The vase is in good condition. And first quality. Our online price for this Cornish Tin Mine Design Vase by Cobridge Stoneware is £199.95. Free UK Post and Packing (1-2 day delivery). The inspiration for this design came whilst Philip Gibson was on holiday in Cornwall. 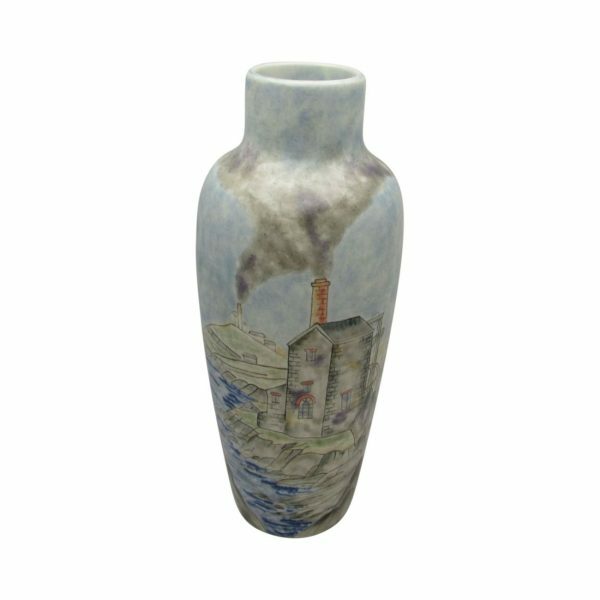 “The soft pastel colours epitomise many people’s perception of the glazes of old stoneware. The severe, cold granite rocks in the foreground of Philip’s dramatic deisgn have been toned down. Wild flowers and lichens are growing everywhere. Soft, subtle and delicate shades of muted colour create a very peaceful and calm vase. The grey granite buildings melt into the natural landscape as though they are one. Softened by the presence of warm, reddish-brown bricks.Over the windows and doorways of the engine houses. Delicate brush strokes reflect a calm. Almost warm sea.Which cab suddenly change. Into fast and furious waves which break over the black rocks. Different techniques and applications of glaze have been used to great effect. Layer upon layer of translucent glaze has been applied to create a pictorial landscape. In the distance, smaller engine houses fade away into the skyline. With the smoke still still visible. Blowing away gently in the wind.” (Extract from Magazine for Cobridge Collectors’ Club March 2000). 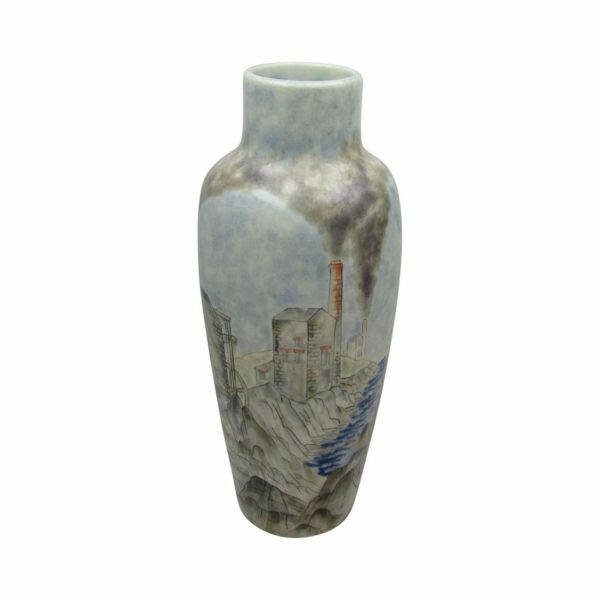 Browse our other small selection of Cobridge Stoneware Vases.